Enhance your bed of choice with a spaciously designed modern headboard. Region captures the expansive moments of restful nights with an elegance that doesn't detract from the simplicity of the design. Made of particleboard with solid wood poles and fine linen upholstery, rejoice with a contemporary design that admirably compliments your contemporary decor. 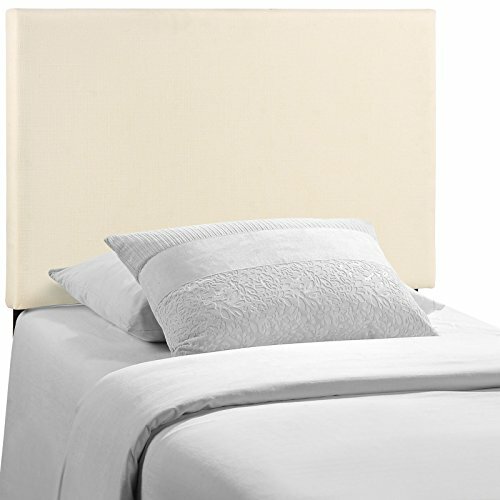 STURDY CONSTRUCTION - Expertly constructed with a durable blend of solid wood poles and particle board, the strong headboard is built to stand the test of time. CONTEMPORARY STYLE - Modern style meets contemporary fashion in this headboard. A welcome update to your kid's bedroom, this minimalist headboard awakens tranquility. MOUNTING POSITIONS - Location A: 25" (Height To Bottom Of Headboard) to 47.5" (Height To Top Of Headboard) Location B: 22.5" to 45" Location C: 20" to 42.5" Location D: 17" to 40"